This lithograph is taken from plate 26 of 'Afghaunistan' by Lieutenant James Rattray. The sketch was taken from the Herat Gate, one of the six gates of Kandahar. In the background is the hill known as Bullock's Hump. The military cantonments were about a mile from the city. 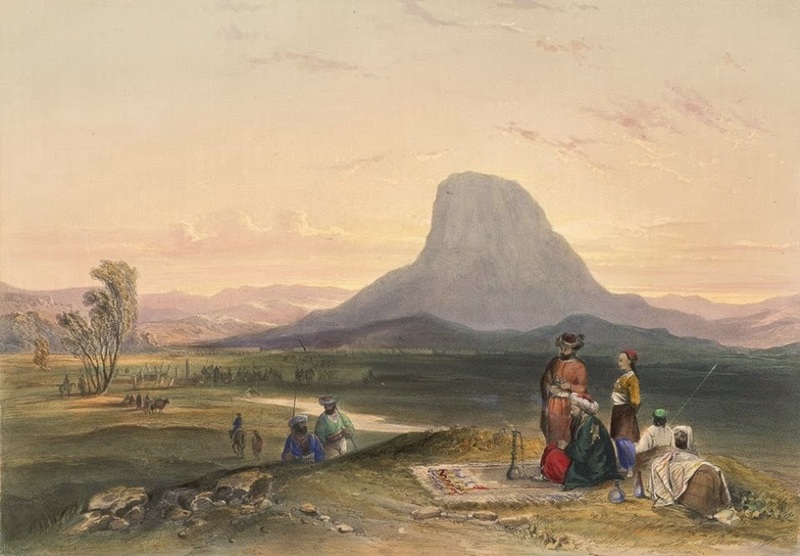 Rattray wrote that this made their position isolated and vulnerable, especially since the land between the city and the camp was suitable for guerilla warfare, and they could at any point be cut off from the city. They nearly met with disaster when General Nott moved almost the entire British force out of Kandahar to disperse the Afghan Army, leaving behind a skeleton staff of about 800 men to garrison the city. On the night of 10 March 1842, the Afghans attacked at Herat Gate and besieged the British for five hours. Rattray was among the defenders and they only survived after a sudden Afghan withdrawal. Despite the fact that Nott's returning army would have been hard-pressed had the defenders' arms failed, the little garrison was accused of inactivity and negligence for allowing the Afghans to besiege them. The whole affair was reported to the government "in meagre and unjust form", to Rattray's deep regret.